Tis the season for entertaining and any season screams “cheese!” to me! 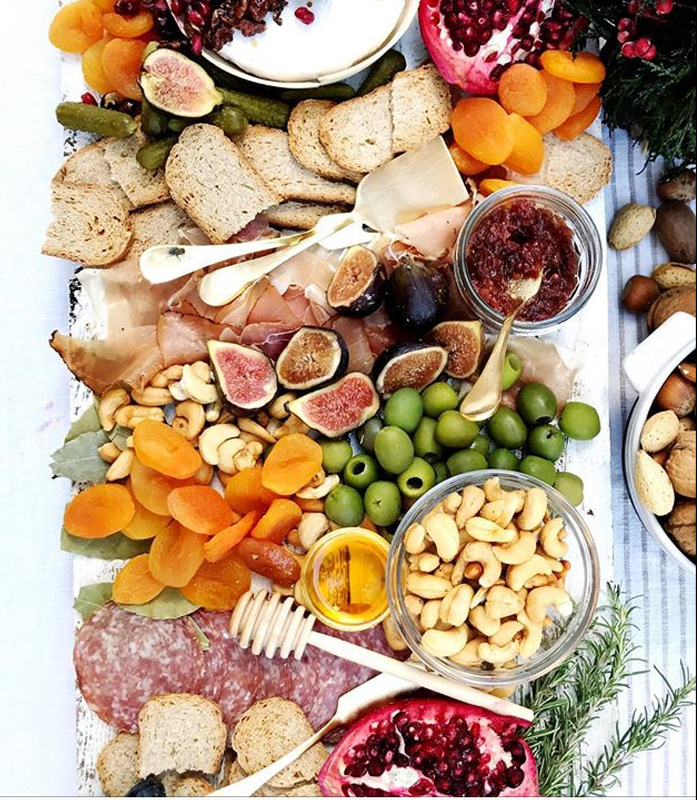 There are lots of parties to attend and lots of friends to host, and in between the meatballs and Christmas sweets, there’s nothing better than a solid cheese board. Filled with so many delectable flavors and delightful to look at (have you seen Instagram lately?! ), a cheese board can please almost any guest. They are also easy to put together and in a pinch, you probably have enough items on hand to throw one together at the last minute. But, if you want to make a picture perfect one, what should you include? That, my friends, is half the fun and entirely up to you, although there are some guidelines. You don’t want to plop down a nut-covered orange cheese ball but you also don’t want to offer your guests overly fussy pairings. So, here are some go-to tips. This is most important. But, before you head to the store, ask yourself how many guests you expect and whether your gathering is more formal or more on the casual side. From there, you can start thinking about cheese. Tia Keenan, author of “The Art of the Cheese Plate,” (yes, there is a book on the subject and it is fabulous!) recommends “building flights,” just like you would for beer or wine. I’ve always heard to choose a cheese from each of the four basic categories of aged, soft, firm, and blue, but Keenan also says picking cheeses around a theme can be fun like choosing cheeses made from the same type of milk such as goat, sheep, or cow, or cheeses based on the region they’re from like Normandy in France or Somerset in England. Personally, I like the first option and the variety it offers both in textures and flavors. For aged, I’d probably choose an aged white cheddar or smoked Gouda. If most of the other cheeses chosen are white though, I’d stick with a regular cheddar to add color to the plate. A nice soft cheese I like is Camembert and most, but not me, like a creamy Brie. Hard-wise, I love both Manchego and Parmigiano-Reggiano but I’m not a big blue fan, so I would offer either a mild Gorgonzola or mildly-strong Stilton. Roquefort will not be found on any cheese board I create! Whatever you do, be sure to serve at least one familiar cheese. Not everyone is a cheese fanatic but almost everyone loves a good cheddar. Amount-wise, figure on offering 3-4 ounces of each cheese per person. One thing most experts agree on is that a cheese plate should never include a flavored cheese or cubes of cheese. Sorry friends, I love a good flavored cheese as much as the next person and I adore the ease of grocery store packaged cheese cubes, but ixnay on the cheese tray. Remove cheeses from the refrigerator one hour before serving. No one wants a cold piece of cheese and the flavors, aromas, and subtleties of each will be enhanced by keeping them at room temp. Keep in mind that cheese is actually a preserved food, so there’s really no need to refrigerate hard, aged cheeses unless you purchase them way in advance, which isn’t recommended anyway. 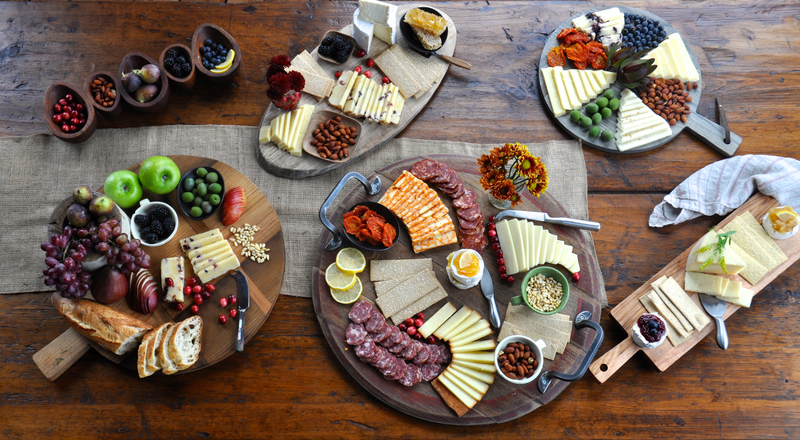 Once you have selected your cheeses, it’s time to put together the board. Always, always, always cut your cheeses before putting them on the board and do so on a separate board. Don’t leave it up to your guests to cut as some may not know what cutting utensil works with what cheese and you don’t want a mess on your board. For soft and crumbly cheeses like chevre and blue, “Bon Appetit” recommends using a wire and for harder cheeses, think about their original shape and use a good cheese knife to slice them with while maintaining that original shape. Slice into wedges or strips that can be eaten in one or two bites. Throw in a few sprigs of Rosemary for adornment, and you’re good to go! It’s also a nice idea to label each cheese on the board. There are so many clever ways to do so. When in doubt, check Pinterest! Part of the beauty of a cheese board is what’s plated in addition to the cheeses themselves. Basically, your board should include something hard, soft, salty, nutty, and sweet. Most people I spoke with recommend a combination of any but not all of the following: crusty bread, baguettes, crackers in different sizes and shapes (but never seasoned), spicy mustards, roasted red peppers, Marcona almonds, raw honey, prosciutto, salami, figs, apples, pears, chutney, and cornichon pickles. If you like, you can also offer some good dark chocolate with sea salt. I’ve also served mini caramel apple bites and they were a hit! 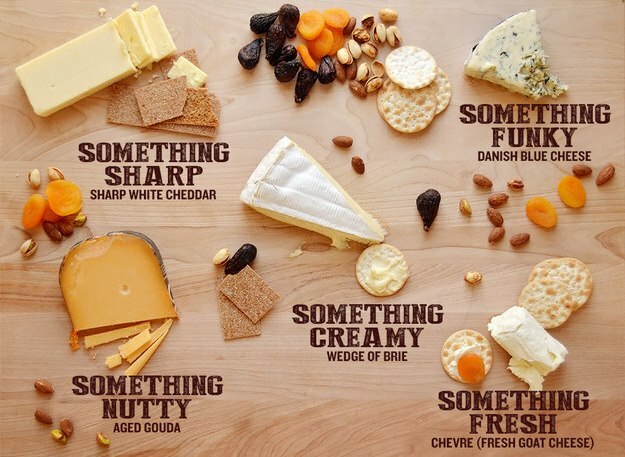 But, don’t go crazy with pairings and just like the cheeses you choose, offer a variety. Choose things both sweet and savory but don’t overload the board. “Bon Appetit” suggests one bread or cracker, one in-season fruit, a jam or compote, and two savory options like pickles, salami, or mustard. So, you have the ingredients, now what do you put them all on? That one’s easy. 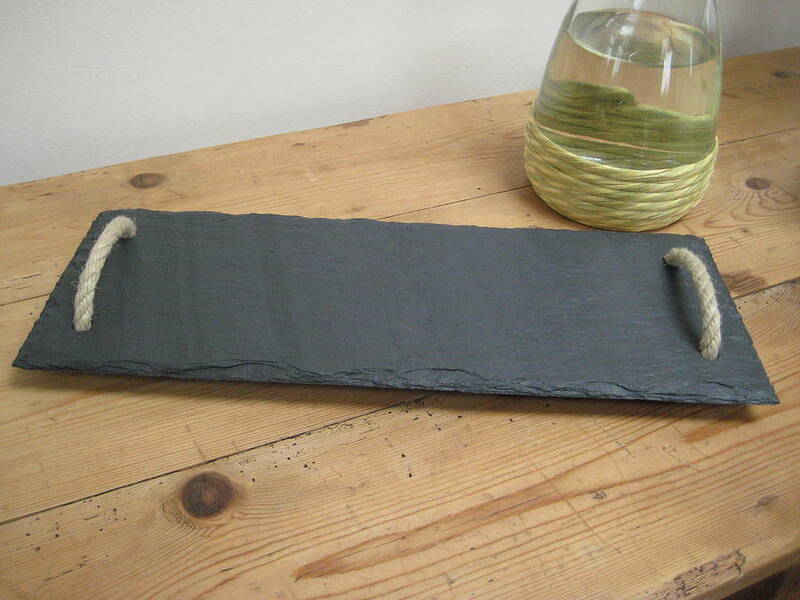 Any wooden cutting board that’s in good shape will do, as will a pretty marble slab, a slate board like the rope-handled one pictured here, or my newest gem, a Himalayan Salt Block given to me by a dear friend. Once you choose the serving vessel, place the cheeses all the while making sure to separate strong ones from mild ones, and then add the pairings much like you would accessorize an outfit. Be sure to provide small plates and cocktail napkins nearby, as well as nice liquid pairings such as a good Sauvignon Blanc or subtle juice. So there you have it: the perfect cheese board. They may look pretty and pretty complicated on Instagram, but they really are pretty simple! Have fun and bon appetit! Great ideas. I am always at a loss as to what and how to serve cheeses and this helps immensely!